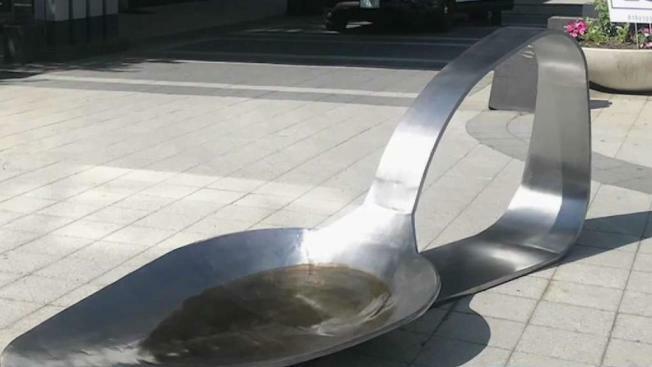 An 800-pound, nearly 11-foot-long steel sculpture of a bent and burned drug spoon, placed in front of the Stamford, Connecticut, headquarters of drugmaker Purdue Pharma as part of an opioid crisis protest, has been removed. Artist Domenic Esposito and Fernando Alvarez, the owner of the Alvarez Gallery, dropped the sculpture outside the headquarters Friday. Police arrested Alvarez and charged him with obstruction of free passage, and the city’s department of public works hauled the sculpture away. Several state and local governments are suing Purdue Pharma for allegedly using deceptive marketing to boost sales of its opioid painkiller OxyContin, blamed for fueling the opioid epidemic. Purdue Pharma denies the allegations. It said it shares protesters' concerns and respects their right to peacefully express themselves. The sculpture is part of an exhibit on the opioid crisis that opened Friday at Alvarez's gallery in Stamford. A news release from the gallery said the work Esposito, a Boston-area sculptor, creates is influenced by the struggles with a family member who is a long-time opioid addict. The gallery is located at 96 Bedford Street, Stamford.